Niche: Helping trainers get more clients with digital marketing. 1. Why building partnerships was key to Jared’s success. 2. Why service delivery was Jared’s weakness when joining and how he overcame that. 3. How Jared chose his niche. 4. How Jared optimized the structure of his days/weeks. 5. Jared’s direct outreach method. 6. How Jared structures his joint venture strategy. 7. Jared's journaling technique for clarity. Get super clear on where you’re going and why you’re doing it. Without clarity you can’t get anywhere. Sam Ovens:	Hey everyone, it's Sam Ovens here, and today I've got Jared Asher, who's one of our Consulting Accelerator members. And Jared joined Consulting Accelerator when his business was making around 4000 per month. And since joining, he's been able to grow it to the point where he's making around 12 grand per month, and in his horizon and in his sight, a lot more than that. This is just the beginning. 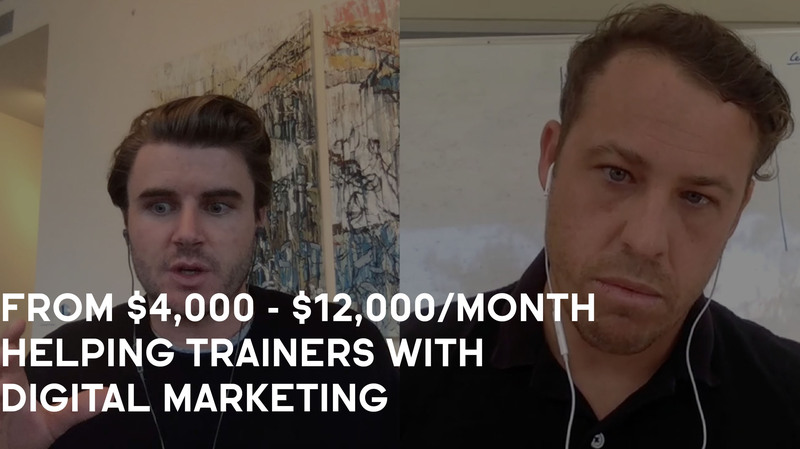 But what Jared does is, he helps trainers and coaches get more customers with digital marketing. Today what we're gonna really talk about ... How many? Jared Asher:	576. Sam Ovens:	From a email list of like 50000? Jared Asher:	Yes. There's Dent, they've got about 50000, and there's Del Bowmont at about 30, 40, something like that. Yeah. And so what we do is, this is really cool actually, I'm doing this with my clients now as well. In Eventbrite, Eventbrite's a really good platform to put a webinar up and invite people to webinar that way. What we did was, the email that was sent out was sent out to the database of Dent and Del Bowmont. And we sent the traffic through to Eventbrite. They registered there with their names, their emails, their phone numbers as well. And 576 have signed up, registered. They did the webinar on Tuesday night. There was a show up rate ... There was 156 show up on the webinar. And 108 signed up for the 12 week program. That was a well [inaudible 00:01:46] strategy. So the bottom line is, I believe the way that joint ventures really really work is just going to networks or going to individuals that have [inaudible 00:01:58] that have a network. And sending out an email, or cross-promoting in some other capacity. I think email really still works though, so ... Does that answer your question? Sam Ovens:	Yeah it does. So what about, 'cause a lot of people who I'm sure are watching this, they don't have a single client yet. They probably don't even know what their niche is, or they know what their niche is, but, if they don't have a client, they can't be that confident in themselves in the offer, because they haven't served someone yet. What is your opinion whether JV's a right net situation? 'Cause I can imagine it, you know, if someone comes to me and they're like, "Sam, dude, can you send an email to your list promoting my thing? I'll give you 30%." If he has never had a client before, I'm like, "I might be sued for this." You know? Jared Asher:	Correct. Yeah. No, you're absolutely right. I think when you're starting out, there's just a ... It's a hard one. And I would say that you can't ... For someone that's starting out trying to go to someone that's got huge amounts of influence, it's not gonna work. Because the people that has an influence, they're not gonna send an email out. It's just not gonna happen. Because there's no trust there. And what are they gonna get in return? I think the big thing, for people that are starting out with joint ventures, is starting out with people that are marginally just above where they are at in their journey. They might have just started their business too. And there might be an opportunity to co-promote each other. [inaudible 00:03:31] a smaller network, but they can still cross-promote. That might be, that they do a Facebook live, and they share, "Hey guys! My friend's doing a Facebook live next Thursday night. Why don't you go and jump on that Facebook live?" Or "My mate's doing a webinar coming up next Thursday night. Here's the registration form. Jump on the webinar." So it's just scale. Numbers. Smaller numbers, but the same sort of process or similar sort of strategy. Yeah. Sam Ovens:	Got it. And how did you get ... 'Cause this is your strategy now and it works well now, but how did you get your first few clients? Jared Asher:	It's a good question, actually. When I first started out in coaching back in the day ... That's a really good question. What did I do? Same thing, same thing. It's exactly what I did, Sam. I reached out to three of my good mates. One of them lived in Melbourne, his name was Nathan. And he had a lawn mowing business. And I said to him, 'cause we were mates and I said to him, I said, "Dude, I'm starting this coaching business. I'm super pumped about this. I really wanna get this off the ground. Do you have any ideas for me? Do you have any things that you think might contribute to my success?" And he says, "Aw, mate. Well, now that you're coaching, why don't I just let my network know? Let my people know that you're starting a coaching business? I've got some business owners that might need your help. I've got some people that might need your help." I said, "Great." So what he did, he contacted I think about five people. Three of them showed interest, and two of them come on straight away. So I had a phone call with them. As I said, the sales process for me was just like, "Yep, let's rock and roll." So yeah. That's how I got my first couple of clients on. Still the same strategy. Just reaching out to networks, really. Sam Ovens:	Just at a way smaller scale, like reaching out to a friend, and then he manually reaches out to some people. It's like networking and partnerships but at a micro-scale. And now with the email broadcasts and the webinars, it's like macro. Jared Asher:	Exactly. Yeah. Exactly. Yeah. Sam Ovens:	I think a lot of people totally underestimate who's in their network. Because they don't think about ... They just think about the people who are in their network. And they might be like, "Well I know there's no business owners in there." But they don't think about the people in their network ... Who's in those peoples' networks, who's in those peoples' networks. Jared Asher:	Exactly. Exactly, mate. And the power of social media these days. As an example, you might have 1000 people in your network on Facebook. But that 1000 people will have ... Think about it. It's crazy, the amount of people that have ... With 1000 people, how many networks do they have on their networks. It's just, sky's the limit. LinkedIn, you know, you can go three deep. You got first connection, second connections, third connections. The crazy thing is, is that if you have 1000 people on LinkedIn, that's the same thing. In LinkedIn these days .... LinkedIn is crazy powerful because you can put up a post, a really engaging post, that gets shown to 50000 people. Even if you've only got a couple of thousand people on your list yourself. Because the second and third get shown. It's far more powerful, I believe, than putting up a post on Facebook on your business page. Way more powerful. Just needs to come down to how the ... understand how LinkedIn works. And how the algorithm works. In the copy that they're looking for. You know, we did a post for one of the other guys, got shown to 540000 people. I'll show you after the webinar. I'll send you a link. 540000 people, 1 post. And it's just crazy with LinkedIn. So networks, again, like social media is a network. And just tapping into that network, looking on your list, finding out ... If you're starting a business, who can you actually go and talk to first? Who can you build a relationship with? And then from there, start to milk that relationship. Not because you want something out of it, but just build relationships with people. I believe that's one of the most important things to do. Sam Ovens:	Got it. So now let's talk about your offer, and how much you price it at. 'Cause I heard a hint from before when you were talking ... It sounds like your offer's pretty expensive. And it sounds like pretty full service. So what do you offer them? Like, what's the current situation, desired situation that you help them transform across? And how do you price it and everything? Jared Asher:	Yeah, cool. So I've got two things that I do. One is done for you marketing. And the other one is mentoring. So my mentoring is 20000 dollars. I charge that 20000 dollars for 12 months, but I start them off on a probationary period of three months to make sure that we're a fit. So it's 20000 dollars over 12 months. In the first three months, it's ... What do I charge for that? It's 1000 dollars ... No it's not 1000 dollars. Wait no it is 1000 dollars. 1000 dollars per month for the first three months. No 1500 dollars for the first three months. Sorry about that. 1500 dollars for the first month times three. And then after that, if we're a fit, then it's 20000 dollars for the 12 months. That's my mentoring. And then, with my done for you marketing, basically I put together like a six month program. And it's 2000 a month. And that includes myself with the strategy. I do all the client liaising. And then I've got a Facebook consultant that does all the Facebook ads. And I've also got someone who does all the learning pages as well. So it's 2000 a month for that. But, the way that I'm structuring it now is I'm finding that learning pages haven't been as profitable. So I'm trying to basically minimize that and keep all the marketing inside Facebook using lead pages. Oh, sorry lead ads or message ads, things like that. So ... Sam Ovens:	Got it. And with the mentoring, how do you structure that? Within that, what do you do for them? Jared Asher:	Yeah, so, the first three months, it's really working on mindset. Really eliciting mindset. One of the biggest things, you would absolutely know this, is mindset is probably ... or it is the thing that hold people back. So first three months is about ... We create like a two day strategy session, where we really unpack their desires, their needs, their wants. It's two days we do face to face. And that there basically sets up the next 12 months. So it's a two day strategy. Talk about all the education they need for reading books, making sure that they've got audios, help them with their meditation. So it's a holistic ... And then of course, and then building at the actual, the tangible stuff like the strategy for their marketing. Strategy for their business. Working out the projections and helping them create spreadsheets. Building up the entire system, basically. So that's two days. And then from there, we do a quarterly review. We do a half-day quarterly review, every quarter. And then in between we do a monthly strategy call for the month that was and the month that comes. And then I use [Floxa 00:10:55] as my go-to for any sort of rapid response, laser sort of mentoring. Sam Ovens:	Got it. Jared Asher:	So if they're having any questions, I just go, "Hey, I've got a question for you. Yup. Here you go. Bang, here's the answer." Sam Ovens:	Got it. And then, why do both? Why do the mentoring and the done for you? Why not focus on one of those. Jared Asher:	Yeah, it's a good question. Well, personally, for me, I think the mentoring is more of a passion project. 'Cause I love the mentoring. I love the working with the people on not just their business, but their life, as well. I love seeing transformation and change. That's [inaudible 00:11:35] my coaching background. The done for you stuff is obviously where the money maker is. So that's where I'm starting to obviously scale up now. Because now I can start building a team. But I have found that with done for you, it's a service that everyone needs. Everyone needs it. And it's just an easy sell. Mentoring is, I only take on a small amount of people. I've only got three clients at the moment. I only wanna have five at any given time. That's more a passion for me. But the business itself is really in the done for you marketing. Sam Ovens:	Got it. Jared Asher:	Yeah. Sam Ovens:	And going through the accelerated program, and you said you went from about 4000 to about 12000 a month. Like what would you say was the most transformative part of that program? Jared Asher:	Yeah. It's a good question, Sam. For you, personally, I would say the first two modules are very very good. Around the mindset, and around the philosophy. I'm big on philosophy. So internally for me, I think that was very powerful. So, yeah. I think that's been very very good for my mindset, as well. You can never stop learning about yourself. So I think those two modules, themselves, really helped me understand myself as well. With some of the philosophical stuff that you went through, the mindset stuff. It's all very powerful. You know cause and effect, of course. That's massive. So yeah, that I think was life-changing as well, for me. Sam Ovens:	Got it. Jared Asher:	[inaudible 00:13:21] Yeah. Sam Ovens:	Cool. And so what's next for you now? Like what are you trying to achieve this year, and what's your plan to get there? Jared Asher:	Yeah, it's scale for me now. So really starting to ... I really wanna start scaling out. So my objective for the next 12 months is to hit 150 by the end of June, and then I wanna get that to at least 250 by the end of December. So that's my mission. In terms of how we're gonna go about that, well, two things we're gonna focus on. One is more partnerships. Obviously that's my flow. And that's what I do really really well. So I wanna get more of that on board. But I also wanna, from the back end, I wanna start building at the team. 'Cause now I've got a system that works. Now I can just basically start scaling out. I've got a really good Facebook ads manager on board. I've got a person that can do all the technical stuff. He can build out pages, if we need it funneled. That sort of thing. So just building out its scale. By the end of 2018, if I hit 250 by that stage, next year is about, probably bringing another person like myself, and duplicating me for sales and BDM. So that I can start focusing on more influence. 'Cause I do wanna start creating more influence in myself as well. That's the next step for me, is really falling into that influence space and focusing on my own brand. And building that out. Sam Ovens:	And why do you wanna do that? Jared Asher:	The reason why I wanna do that is more. More influence. So more influence, the more attraction I have. And then that gives me more scope to build more partnerships. So yeah. Build a bigger list, bigger profile. Create more status. And obviously, that's not from an egotistical point of view, but just more the fact that it's gonna help the business grow from inside out. Sam Ovens:	And why do you wanna grow the business? Jared Asher:	The big thing I wanna grow the businesses for is, I have a family. I've got three young children, so I wanna leave a legacy for them. My big "why" is ... Actually, I'll tell you my big "why." So I used to work with an outsourcing company back in the day in Philippines. And I did some work for them. And when I was over there, I went to an orphanage. And we did like a charity event for them. And there was 80 children between the ages of one to nine in this little orphanage over there. And they were sexually molested and abused. And when I got there, it really shook me up. It really hit me hard. And I remember walking away from there, and I just ... I've got children myself. So when I come home, I saw those kids and I saw my kids. It was just like, I just, I wanna be able to help children that have this. So my big overarching "why" is I wanna have enough financial backing that I can contribute to causes such as orphanages in the Philippines. And be able to help these little kids. Because they've got ... I know they've got support, but there was only 80 children there. There was hundreds of thousands of children that are in the streets of Philippines in Manila alone. And these kids need help. So that's my big overarching "why." But my family, obviously, is personally what I'm doing this all for as well. But from the world's point of view, I wanna be able to create impact and help these children over in other countries. Sam Ovens:	Got it. Cool. And what would you ... How long have you been in the program for, in total? When did you join? Jared Asher:	Yeah, I started about 12 months ago, but I didn't really do anything with it until about ... [inaudible 00:16:58] 12 months. I didn't ... Probably about September last year is when I start really investing myself in the program. When I started learning all the modules. So ... Sam Ovens:	Why then? Jared Asher:	It's a good question. Probably because, I had a lot on at the time, but I know it was the right thing for me, but I didn't really take it seriously. And it took me a while to get clear on my objective as to why I'm doing it in the first place. Not why I'm doing the program, but why I'm in business in the first place, you know? And why am I going in this particular direction? So last year was a bit of a rough year for me. At the start of the year. And it took me a while to sort of find my feet. And then, sort of latter part, moving into latter part of last year, I started finding my feet. And I'm like, "Alright. Now I'm clear. Let's rock and roll." So that's why ... I'm like, "Okay. I need to do this training." So, yeah. Sam Ovens:	Got it. So you've been in the community and the program for a while. Like, what would your number one piece of advice be for other members? Jared Asher:	Yeah. Number one piece of advice would be to get super clear. Get absolute clarity on where you're going and why you're doing it. That's the number one pice of advice I can give anyone. Without clarity, you can't get anywhere. And I think if you get super clear on your direction, get super clear on who you wanna work with, and get super clear on what problem you can solve for them. That is the thing that will help you get to where you want to. It might take you longer than others, but the point is at least you're on the path to getting somewhere. And that's my advice. Sam Ovens:	And how does one get clear? Jared Asher:	Get clarity? Well for me, what I do, is journaling. I've got a journal. And I unpack my thoughts a lot. And I ask questions to myself a lot. Journaling I think, for me, has been the most insightful thing. Because everything sits up here, unless it's out here it's not real. So journaling, for anyone that's watching this, journaling is one of the best things you can do. Use it and abuse it. Sam Ovens:	Do you do it at the same time each day? Or what's ...? Jared Asher:	Yeah, absolutely. My pattern, or not pattern, but like a ritual. I get up in the morning, I do half an hour of reading. I do half an hour meditation. And then during that process, at the end I'll write some thoughts in my journal. Before I go to bed, I'll write thoughts as to how the day went. What did I learn, and what can I work on for the next day? And I do that every single day. Sam Ovens:	Got it. Nice. That's a good tip for people who are listening. If you're not clear, start doing some journaling. And see if that helps. I've done it in the past and it definitely helps at times when I'm not clear. But I've never kept it as a discipline, constantly. But I think it could help. Like have you read that thing, "The Artist's Way?" Jared Asher:	Yeah I have. It's a great book. Very good book. Sam Ovens:	Yeah, is that what kind of got you into journaling? Jared Asher:	A little bit. I've done a lot of reading on biographies. And one of the biograph ... Do you want me to show you something? Sam Ovens:	Sure. Jared Asher:	Just give me one sec. I'll show you something. One sec. [inaudible 00:20:25] So, this book here. You might have seen of that guy, his name is Bruce Lee. I find him, he's got a lot of really cool life hacks. And one of the things he talks about is journaling. He's big into philosophy. Eastern philosophy. And one of his success tools is his journal. And he used to write religiously, daily. And so I'm like, "Okay." And so I got a journal. And that's how it got me into it, primarily. And then I read "The Artist's Way" and I'm like, "Aw, cool." So it was sort of through that. But, yeah. Sam Ovens:	And do you write it by hand, or typing? Jared Asher:	No, all by hand. Sam Ovens:	Oh, I got it. Jared Asher:	I've got my little black journal. I've written a little sort of life mission in the opening part of it as well. So, yeah. It's just a nice little journal. Yeah. Sam Ovens:	Cool. Jared Asher:	Yeah. Sam Ovens:	Well, thanks a lot for jumping on and sharing your story. And there's a lot of good tips in here. Specifically, like what I took away was, one is growing a network of people to refer to you. Even at any early stage, you just find people slightly bigger than you. And you can use that at a micro-scale even to get first clients. And then as you grow, you can start evolving into more of the JV type deals. I think where I got stuck, personally, was back at the beginning, I didn't see the smaller scale one. I thought, "I could reach out to these big guys, but they're not gonna promote me." Which was true. And I didn't see how that could happen at a smaller scale. So that's a good lesson for everyone. Also the journaling. Getting clear. I agree. Like, whenever I'm doing best, it's when I know exactly what I'm doing. 'Cause when you know what to do, you get it done. It's when you're floundering around that you're screwed, you know? Jared Asher:	Yeah, exactly. I agree. I couldn't agree more, in fact. So I find for me, personally, I naturally get unclear. So yeah, the journaling really helps me. Yeah. Sam Ovens:	Awesome. Well thanks a lot for jumping on, and sharing your story. Now if anyone wants to check out, like, 'cause we're gonna put this on YouTube too, and some non-members will see this too. If anyone's interested in learning more about you and your business, how do they find you? Jared Asher:	You can go to my website, www.jared ... so J-A-R-E-D-A-S-H-E-R ... .com.au. Sam Ovens:	Awesome. Cool. Well thanks a lot for sharing your story. Jared Asher:	Thanks, Sam. Sam Ovens:	See ya. Jared Asher:	Take care. See ya.